Are you following Diversity in YA Fiction? I love their monthly posts featuring the month's new releases of books that include diversity. If you're interested in maintaining a culturally diverse collection, this is a great tool to help stay on top of new releases! This post on Playdough Play Time has got me thinking about doing a playdough program at the library. Hi, Miss Julie's shared several posts from this blog Not Just Cute, which is written by an early childhood educator and contains lots of great information about early literacy and child development. If you work with young children, check it out! 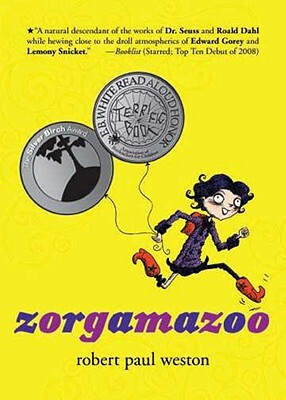 Travis at 100 Scope Notes pointed out the new paperback cover for Robert Paul Weston's Zorgamazoo, which incorporates award seals into the cover design. Very snazzy. Mel of Mel's Desk shares a really awesome Caldecott program that she's run with inmates at the county jail. This is a unique way to inspire excitement about books! Waaaaay back last year, the ALSC posted their updated list of Great Websites for Kids. Check out those links and see what you might want to add to your library's website. Check out this Guide to Reviewing GLBT Books over at Bounjour, Cass! This is a great introduction to terms you might come across and since that post says "Part 1", I hope that means she'll continue the series! Thanks to Librarian Pirate for the link. Boys need male reading role models! So check out Fathers Read, a blog featuring reading dads of all types. Thanks to A Fuse #8 Production for the link. And for funsies, check out prom pictures of authors, editors, and more at Aimee Ferris's site to promote her upcoming book Will Work for Prom Dress (Egmont USA, February 2011). What a cute way to create excitement about her book! Thanks again to A Fuse #8 Production for the link! And that's all I've got for you today! If you're facing snow, ice, and incredibly cold wind chills, stay safe and warm!